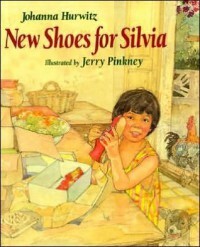 New Shoes for Silvia is about a little girl named Silvia, who received a pair of shoes from her Aunt. She loved every bit of her new, red pair of shoes. However, there is only one problem! They do not fit! Silvia learns to improvise with her new shoes everyday, until they suddenly fit. Silvia learns a great lesson from this situation. Although; she couldn't wear her shoes when she wanted to, they came in handy for other things. Idea: I plan on using this book to integrate aspects of different cultures into my classroom. I will also provide activities on gratefulness and improvisation, during this time. I absolutely love this book, and plan on using it for any grade that I teach up to 3rd grade!